Impeachment: Cass Sunstein, an adviser to Barack Obama from the University of Chicago Law School, says that prosecuting criminal conduct from the Bush Administration. risks a “cycle” of criminalizing public service and Democrats should avoid replicating retributive efforts like the impeachment of President Clinton–or even the “slight appearance” of it. 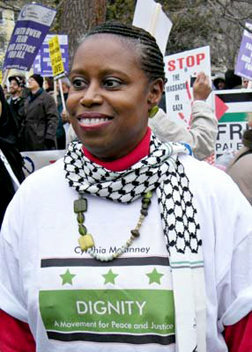 Cynthia McKinney, before leaving the Congress in 2006 introduced impeachment resolution against George W. Bush. Afghanistan: Obama says we must add 10,000 troops and win in Afghanistan because it is the “right war.” McKinney is opposed to the Afghanistan war and wants us out right away. FISA Bill: Sen. Obama voted in favor of the Bush FISA surveillance bill. Former Congresswoman Cynthia McKinney was opposed to the bill. Experience in Congress: Cynthia McKinney served 12 years in the US Congress. Barack Obama has been in Congress for 3.5 years. They both served in their state legislatures in their respective states. Iraq: McKinney calls for a “quick and orderly” withdrawal of all U.S. forces and mercenaries now occupying Iraq. While in Congress she opposed funding for the occupation. Obama calls for a “responsible” and “honorable” withdrawal and has recently changed his withdrawal timeline to 16 months after elected. Obama also uses the term “redeploy” which means move many troops onto the big US permanent bases in Iraq and also move many to bases in nearby Kuwait so they can be sent back into Iraq when needed. Obama voted for most Iraq occupation appropriations. Military Spending: Obama calls for increasing the military by at least 92,000 troops and supports increases in military spending. McKinney has long been an opponent of increased military spending and while in Congress often took on former Secretary of Defense Donald Rumsfeld in House hearings demanding answers to her questions about what happened to the $2 trillion the Pentagon lost. Public Financing of Elections: Obama recently changed his position and now refuses to participate in public financing of the national election. McKinney supports public financing. Trade Issues: Obama’s economic adviser, Austan Goolsbee from the University of Chicago, last February urged the rightwing Canadian government not to pay too much attention to Obama’s campaign critiques of NAFTA, explaining that the candidate’s rhetoric was “more reflective of political maneuvering than policy.” McKinney opposes NAFTA, CAFTA and all the rest of the so-called “free trade” agreements, which are “anti-union” and institutionalize corporate profits and priorities. The Pacific Green Party of Oregon currently has a “peace slate” which includes candidates for 4 out of 5 congressional seats. All of these candidates have expressed their commitment to ending the war in Iraq, and none of those who are elected will be as vulnerable to the pressures to conform to the Democratic congressional leadership’s programs. For more information on these candidates, see http://www.youtube.com/user/mikevanh. Video clips of Cynthia McKinney at her recent Eugene visit are also available on this site. This film is a lengthy pro-military, war-glorification promotion for National Guard Recruitment, probably paid for with your tax dollars, then forced upon you once you pay for the price of a theater ticket. People are encourged to go to ANY of the movies at AMC (because we don’t want to look as though we are targeting a film which is art). When the War Piece starts, your gut will tell you what to do. Best thing to do is , COMMENT in front of the audience that this is completely unethical at every level, and you are getting your money back immediately. 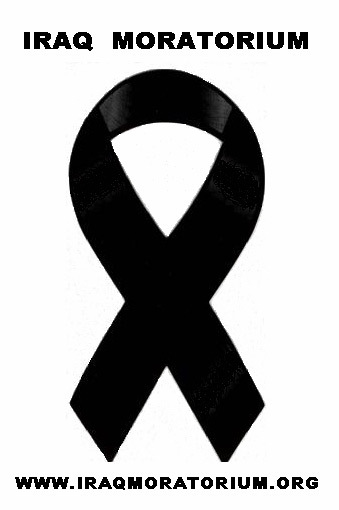 Encourage a walk-out. Oakland City Council unanimously adopts No War on Iran Resolution! Greens are encouraged to take the text of this resolution (link below), modify it as necessary, and then approach a city, county or tribal council member to get it brought to the floor. This kind of local action is very empowering. The Oakland, CA City Council adopted by consensus, a strong resolution calling on the US government not to attack Iran. About 18 people, representing a good cross-section of the Oakland public, including a number of Iranian-Americans spoke eloquently in favor of the resolution. Everyone talked about the need to abolish war altogether and to work cooperatively to meet human needs in Oakland and everywhere. Following is the link to the text of the resolution.